1080 60p/50p conversion, convert TM700/SD600 to FCP/FCE, deinterlace/merge AVCHD files. You just recorded so many memorable moments like wedding party, birthday party, etc in your AVCHD camcorder that you plan to store in your Apple TV and enjoy the videos in your big screen TV together with your family and friends, things might get stuck when you find that Apple TV simply can not read/recognize MTS/M2TS files generated in your camcorder! "I had ever owned a Canon HD HF200 camcorder generating files with MTS extension. And I had shot my sister’s wedding and had been going to show the wedding recordings to the guests as my sister and her husband were coming to give a reception. But that time I was really in a time crashed as my Mac couldn’t read and play the camcorder MTS footages and I couldn’t put them in my Apple TV to show the wedding on the widescreen TV. But finally I had figured it out and successfully solved my problem by converting MTS to Apple TV MP4 format with Aunsoft Mac MTS/M2TS Converter." This is the feedback from a good guy. Now if you also have such a demand, please keep reading, i will let you know how to convert AVCHD MTS/M2TS files to Apple TV MP4 format with high quality. Check it out! 1. First of all, you need to download a proper version of MTS/M2TS converter for your Windows PC or Mac, install and launch the app. Then add AVCHD files to the program by directly drag-drop the footage to the app or click “Add” button to load the files. Batch conversion is supported and the program is terrific for large files (some of my files are 10+GB). 2. 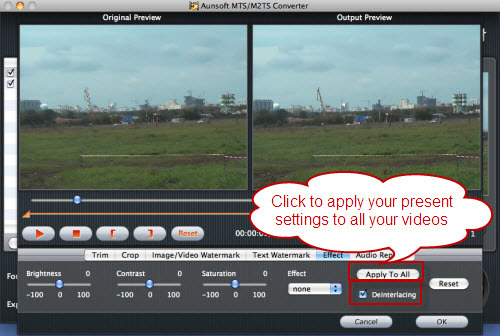 Trim, crop and deinterlace your AVCHD MTS/M2TS files. Editing functions are available in Aunsoft Mac MTS Converter by clicking “Editor” button in the menu bar. You are allowed to trim, crop your videos as well as adding text/image/video watermarks, etc. In my case, I just made some trimming and cropping in the wedding footage. 3. Choose Apple TV output format and specify your destination folder for converted videos. If you are a novice to video conversion, you may get all confused to the output settings for your Apple TV. Which video & audio codec will produce best video quality with median file size? Now don’t bother yourself. It’s as simple as ABC in this excellent Apple TV converter. As you can see from the screenshot below, you can directly choose preferred Apple TV profile with proper pixels from Apple TV catalogue in “Format” drop-down menu. 4. 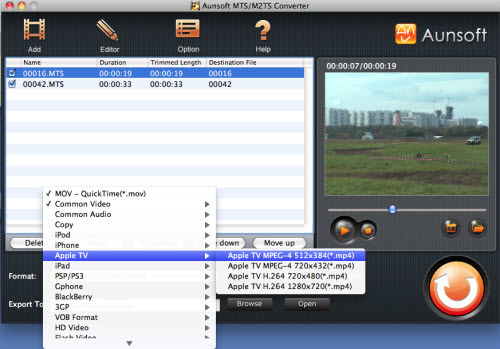 Start AVCHD MTS/M2S to Apple TV MP4 conversion by clicking the big “Convert” button. Here I’d like to present one big spotlight for Aunsoft MTS Converter-the function of merging/joining/combining multiple MTS/M2TS files to one single output! You can realize the function by simply ticking the checkbox of “Merge into one file”. I’m sure many of your will love the function. Because it was a life-saver for me! If you want to know more about converting AVCHD MTS/M2TS files to Apple TV, please enter: Convert AVCHD MTS/M2TS to Apple TV MP4. How to Play AVCHD with Sony DSC-HX5V on VLC Media Player? I bought it because it converts .mts files to formats I can use, it allows me to trim and crop my footage, it offers high resolution output (I output to 1280x720) and it deinterlaces (this is really important to me). The program is really excellent, simple to use and reliable. I will definitely keep Aunsoft in mind if I need any other video software. Thank you again! I use Aunsoft to convert the .mts files produced by my camcorder (Sony CRX110)...the software works great...and the quality of the conversion is excellent.